RING OF FEAR is one of the films from John Wayne's production company, Batjac. Clearly, the Clyde Beatty Circus is the star of the film despite Mickey Spillane (the author of the Mike Hammer novels) playing himself as he investigates who is causing trouble at the circus. According to the Internet Movie Database (if the info is right), Mickey is an uncredited writer of the film. It's not hard to see why Mickey is in this movie (a decade before he played his own creation Mike Hammer in THE GIRL HUNTERS) because sometime during the 1950s he did work at the circus and was even shot out of a cannon. Regular Batjac player Sean McClory (more on him when I review PLUNDER OF THE SUN later in the week) plays homicidal maniac Dublin O'Malley who rejoins the Clyde Beatty Circus to be the new circus master and go after the object of desire, aerialist Valerie St. Dennis (Marian Carr) who he used to be romantically involved with over six years ago. All of the circus stuff is real and it is big credit ot the film that they used a real circus, the Clyde Beatty Circus, for RING OF FEAR. Clyde played himself and Pat O'Brian took the part of the circus manager. Clyde started out as a big game hunter who turned to lion taming and formed his own circus. He has appeared in numerous films (one was HERE COMES THE CIRCUS short which is also a song that opens up RING OF FEAR). He used a pistol and whip in his lion taming and appears to be the first to use a chair in his act. Too bad the Batjac trailer or the original trailer for RING OF FEAR (it is on some of the other Batjac releases from Paramount) isn't included on the DVD. A few production notes might have been good too. RING OF FEAR is a good movie and it is one of four Batjac movies (the others being MAN IN THE VAULT, TRACK OF THE CAT and PLUNDER OF THE SUN) being released to DVD next week on June 6th. It is a good time capsule for showcasing what the circus was like in the 1950s. Just dion't expect this reviewer wanting to be a lion tamer anytime soon. Some print damage is present, but the transfer and image detail is good. The surround action isn't very impressive at all. Both tracks sound the same. The dialogue and sound elements are clear. 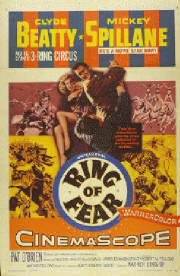 FINAL ANALYSIS: RING OF FEAR is a fair movie due to the circus acts while the plot is secondary to what the circus performing.